So every Tuesday Horse Race Base send out an email that details how the systems that you have saved have performed since the day you saved them. This morning as I do every week I reviewed the list to see what's working and what's not. The first pleasing result was from the Nicky Henderson Debutant system we published at the beginning of November. As you'll recall this was sent in by a reader, Derek. So today's message is short and sweet, keep an eye on this system for more winter profits. Horse is have it's first run and is trained by Nicky Henderson. It's price is between Evens and 16/1. It is 6 years old or younger. And we only bet in the main season between October to March inclusive. We have a fellow Daily Punt reader to thank for today's micro system. Derek posted the following micro system in the comments yesterday. I use a micro system for Henderson and it’s based on debutants having first run under UK rules. It is based mainly on NH flat and hurdles. I know you use horseracebase so I’ve just cut and pasted my rules. Here are the rules in plain English as opposed to HRBish! Heres the overall performance since 2003. You will see that it has performed steadily year after year since 2003. Henderson repeats the same training routine year after year and this has allowed me to have the above and two other micro systems (handicap hurdles and mares) on the man from severn barrows. Tomorrow we have Nick Hardman back with a look at Friday and Saturdays racing at Newmarket. Today I want to tell you about an offer for a new tipster service that I dont think you should miss out on and update you on our big priced winner system that we shared last week. The new tipster service is from a guy called Gary Poole. Gary has been posting his tips for free on Twitter for the past year and has had some huge touches (@bookiesenemyno1). He has now launched his own service and is offering a full months access for just £7.99. 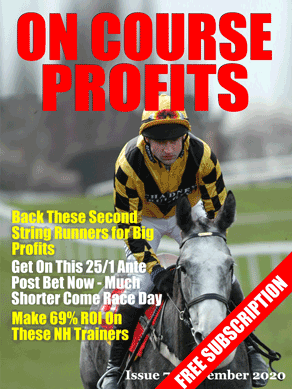 The Big Priced Winners system, you'll recall, looks at horses that won last time out at huge odds. They had to win at 25/1 or bigger and by a length or more. In the text I said that we should only back when the horses last race was on the Flat Turf, but I didn't include that rule in the actual system. Todays Race is on Flat Turf and it's in the main season May to September. In it's last run the horse won by a length or more at odds of 25/1 or bigger. Today I want to update you on the system we created as a result of the article by Peter Hawkeye. By the way Hawkeye Tips is making great profits with 32.4 points profit so far in June which follows on from 37 points in May. Together since the Flat season kicked off proper with the Guineas meeting that's 69.4 points profit all made from just 28 bets, which is a whopping 247% return on investment. Bet all horses running on the Flat when ridden by one of these amateur jockeys. Since Peter first alerted to this there have been just four bets. Two on the day that we published the article, both in the same race and they gave a 3/1 winner. Then five days later, again two in the same race giving a 7/2 winner. As a result of our first system we had two interesting comments. One said surely Simon Walker should be included? I'm going to say no! The results show that Simon was profitable in 2012, but not 2011 or 2013. He has a good strike rate but I guess his mounts are just over bet. I don't think this rule is necessary, and the less rules the better. Most of the races had between 8 and 15 runners anyway and the ones that didnt fared ok. Most of the races were Handicaps (96%) and those that weren't didnt make a profit. So again keeping things simple I'm going to say Handicaps only. All the profit did come in these months and they are the main Flat Turf season months, only 4% of the runs fell outside the main season. We'll include this rule. I like me a big priced winner every now and then, and there was some huge profit from the outsiders, so I'm excluding this rule. Again I see profit across all last time out positions, so I'm not using this rule. Here's what we're left with. Rides on the Flat, on Turf in a Handicap between May and October then bet.